I am the kind of girl that carries the same winter bag for months and then finally towards the end of summer purchases a new summer bag - I'm always a little behind. I saw this adorable handbag a few weeks ago, but it wasn't on sale and I couldn't bring myself to pull the trigger - I thought it was really too stylish for me. But, one recent trip to the store and one sale later, and Mama's got a brand new bag! 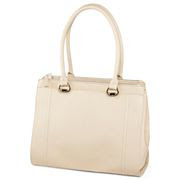 Although it is very practical and has "I'm a Mom" written all over it because of its size and crazy compartments, I still think it says stylish, elegant, and classy. My husband, however, says it screams "Grandma Mom" not "Styling Mom." So, now I would like your opinion. What does this bag say to the world - or at least to those I see on a day to day basis? You can be brutal - my sense of fashion is a work in progress. I like it. I need a bag that can hold a lot of stuff and still looks stylish. My grandma's was one of those carpet bag Mary Poppins looking things -- I think your safe from falling into granny style with this one. But with my luck - I wouldn't dare get white. red would be nice though. I love this bag! I don't think it screams grandma at all. It's classy, and looks somewhat professional. Ok, I'm going to respectfully disagree. 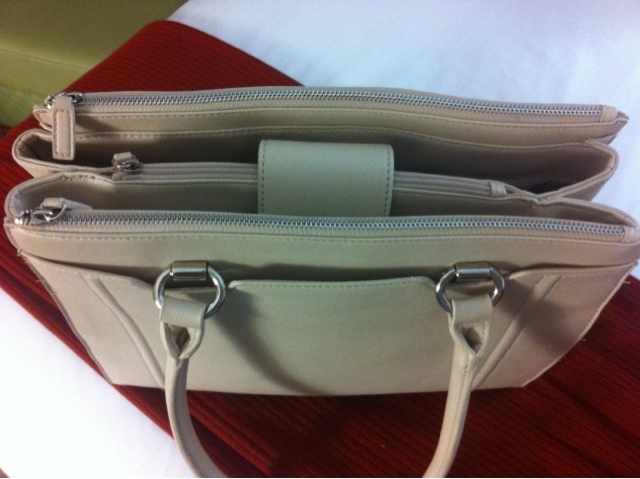 It's a perfectly nice bag, but it is definitely conservative. I agree with your husband; it looks like a bag my mother-in-law would carry. Not offensive, but not exciting. I think the color doesn't help - it's blah. Accessories are where you can be a little daring - you may not buy the newest clothing trends, but your purse can give some oomph to your ensemble.